RORSAT (Radar Ocean Reconnaissance Satellite) were Soviet naval reconnaissance satellites often launched to coincide with major NATO and American navy maneuvers. A characteristic feature of RORSATs was their large radar antennas used to bounce signals off the ocean in order to locate ships. The strength of the signals required for this to work effectively, combined with the relatively backward state of electronics technology in the Eastern bloc, forced Soviet designers to adopt a radical solution – the use of a small nuclear reactor to power the RORSAT radar (see nuclear power for spacecraft). 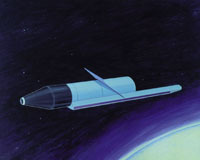 Although prototype RORSATSs in the mid-1960s flew with only chemical batteries, their operational counterparts, beginning in the 1970s, carried reactors. This introduced a serious risk of contamination because all the RORSATs reentered after a few weeks or months in orbit. To counter the problem, each RORSAT consisted of three major components: the payload and propulsion section, the reactor, and a disposal stage used to lift the reactor into a higher orbit, with an altitude of 900–1,000 kilometers, at the end of the mission. Thus while the main spacecraft decayed, the reactor continued to circle the Earth. Unfortunately, the lifetime of an object at this altitude is about 600 years, whereas uranium-235 and -238 have a half-life of more than one billion years. This means there is presently, in 1,000 kilometer × 65° orbits, about 940 kg of highly-enriched uranium and a further 15 tons of other radioactive material including tens of thousands of droplets, 0.6–2 centimeters in diameter, which are the remains of the liquid sodium-potassium used to cool the RORSAT reactors. There have also been accidents – the worst of them on January 24, 1978, when a RORSAT malfunctioned and crashed within Canada's Northwest Territory, showering radioactive debris onto the Great Slave Lake and surrounding region.